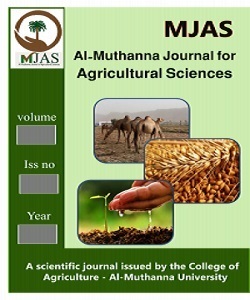 This experiment carried out in the laboratory of plant tissue culture in the Technical Institute / Musayyib for the period from 1/3/2010 until 1/12/2010 to study the four concentrations of growth regulator 2 . 4 - D is (0 , 1, 2 and 3) ml / liter -1 and licorice extract is ( 0 , 0.25 , 0.50 and 1) ml / liter -1 and the overlap between them in the growth and development of parts of vegetative and Tgazirha to plantlets apricot outside vivo invitro The results showed the following : The presence of statistically significant differences for all traits when increasing concentrations of growth regulator 2,4-D concentrations and licorice extract , and the overlap between them . The increase was clear to rate traits registered the highest rate at Focus 3 ml / liter -1 for the orderly growth of 2.4 - D has reached 1.62 cm plant height and 136 mg of the weight of soft paper and 8.15 and 2.78 and root lengths of 2.03 cm . While it was noted that the increase in the concentration of licorice extract led to an increase for all traits ( plant height 1.13 cm and 127.5 mg of the weight of the soft and 6.66 paper , 1.37 root lengths 1.33 cm) recorded a combination between the concentrations of 2,4-D and licorice extract (3 ml / liter -1 2,4-D and 1.0 ml / liter -1 higher results and all the qualities and the increase was clear was reached (1.58 cm high plant 0.140 g weight mushy , 9.00 and paper and 4.4 root and the rate of the length of 2.28 cm ) compared to treatment comparison which gave the lowest rate and all the qualities . نفذت هذه التجربة في مختبر زراعة الأنسجة النباتية في المعهد التقني / المسيب للفترة من 1/3/2010 ولغاية 1/12/2010 لدراسة اربع تراكيز من منظم النمو 2. 4 – D هي ( 0 , 1 , 2 و 3 ) مل/لتر-1 ومستخلص عرق السوس هو ( 0 , 0.25 , 0.50 و 1 ) مل/لتر-1 والتداخل بينهما في نمو وتطور الأجزاء الخضرية وتجذيرها لنبيتات المشمش خارج الجسم الحي invitro ولقد اظهرت النتائج التالية : وجود فروقات معنوية احصائية لجميع الصفات المدروسة عند زيادة تراكيز منظم النمو 2,4-Dوتراكيز مستخلص عرق السوس , والتداخل بينهما. كانت الزيادة واضحة لمعدل الصفات المدروسة مسجلة اعلى معدل عند التركيز 3 مل/لتر-1 لمنظم النمو 2.4 – D وقد بلغ 1.62 سم ارتفاع النبات و 136 ملغم للوزن الطري و 8.15 ورقة و2.78 جذرا وبأطوال 2.03 سم . في حين لوحظ ان زيادة تركيز مستخلص عرق السوس أدت إلى زيادة لجميع الصفات المدروسة ( ارتفاع النبات 1.13 سم و 127.5 ملغم للوزن الطري و6.66 ورقة , 1.37 جذرا وبأطوال 1.33 سم ) وسجلت التوليفة بين تراكيز 2,4-D ومستخلص عرق السوس ( 3 مل/لتر-1 2,4-D و 1.0 مل/لتر-1 أعلى النتائج ولجميع الصفات وكانت الزيادة واضحة وقد بلغت ( 1.58 سم ارتفاع النبات , 140 غم وزن طري , 9.00 ورقة و 4.4 جذرا وبمعدل طول 2.28 سم ) مقارنة بمعاملة المقارنة والتي اعطت اقل معدل ولجميع الصفات.